This astronomical ring dial (leftmost in the illustration) is unsigned but very close in size, layout of the scales, and script to a dial in the Mus?es Royaux d'Art et d'Histoire in Brussels with the inscription 'Fr Ioannes Motter alias mueter'. On these grounds it has been attributed to the maker Johannes Motter, who was active around 1550, probably in Louvain. 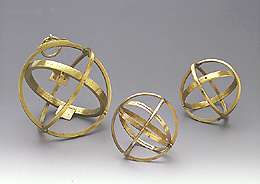 A further astronomical ring attributed to Motter is to be found in the Museum of History of Science, Oxford (Epact 16387).